« Shrek is Staying Dry! Since the official announcement came out on Main Street at Cobblestone Press, I’ve been leaping around doing the happy dance. Congrats to the other authors! Now, long ago and very far away, I was a member of the Double-barreled Tiger Cubs, a Sherlock Holmes society at the UofI in Urbana-Champaign. 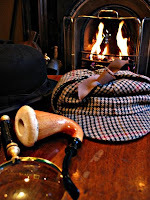 Although I’ve written my share of Holmes fan-lit none of it is worth publishing (yet…) I did, however, get the premise for the story from Holmes’ older (and smarter) brother Mycroft. is a retired basketball star living off his fame and fortune until women he’s dated begin disappearing, then reappearing…dead. With Drake framed for murder, Sapphire has to leave behind the safety of her home to save the man she loves…or die trying. This entry was posted on Sunday, August 19th, 2007 at 11:22 am in Blurbs and Promos. You can feed this entry. Responses are currently closed, but you can trackback from your own site.